My Moo Cards Are Here!!! It has been just under 3 weeks (although I swear it has felt much longer!) and my Moo cards have finally arrived! 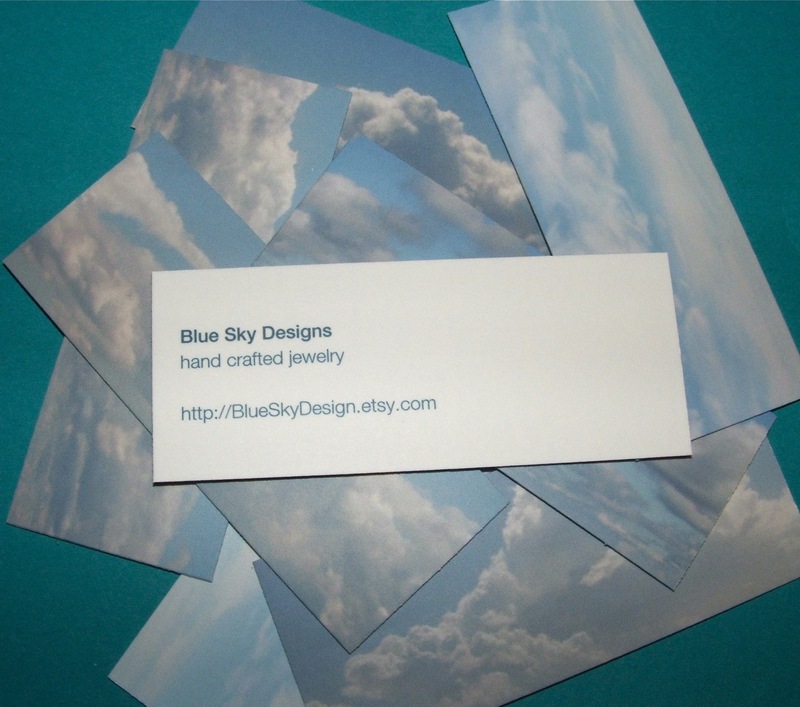 Each card is printed in a matte finish with a cropped photo of the blue sky and fluffy white clouds! The images are all from various pictures I have taken. The text on the back is in blue in keeping with the whole “blue sky” theme. The cards are 28 x 70 mm so they are nice and small. I added two new items to my Etsy shop. I hope you like them! We have a Contest Winner!! Congratulations to Vickie who is the very first contest winner here at Ranting & Raving! Thanks to everyone for their very creative entries! Blue Sky Design… your silver lining is here. I need a catchy phrase!! As you may already know my Etsy site is called Blue Sky Design and I’m looking for a catchy phrase that I can add to my shop banner and my next batch of business cards. Just as an example a cute shop called Pillowhead has the phrase “Life not squishy enough? You need Pillowhead!”. I’m not looking to copy them by any means but I would love to have something interesting to say other than “hand crafted jewelry”… yawn. I would love it to be related to blue skies or fluffy white clouds. Something unique, not just a quote from someone else. I’m looking for something whimsical but still professional. If you have any suggestions please leave them in the Comments section of this post or convo me on Etsy. You have your mission! There will be a small prize for the winner! Update: I have decided on a prize… the winner of this contest will receive a discount of $5 on any item in my shop as well as free shipping for that item anywhere within North America. I’ve added a few more items to my Etsy shop!